Get out of the doctor’s office and turn on your smartphone. A recent report by consulting firm Deloitte predicts that there will be 100 million e-visits globally this year, saving healthcare systems more than $5 billion in costs when compared to traditional in-person visits with physicians. This projection represents a growth of 400% from 2012. E-visits (also known as “telemedicine”) consist of electronic interactions between patients and physicians through text, email or telephone, as well as photos or videos. The report found that the majority of e-visits focus primarily on the exchange and collection of patient data through forms and questionnaires. “For example, patients with symptoms of certain illnesses such as sinusitis, strep throat, allergies, bladder infection or acne would complete an online form and then receive a diagnosis and, if required, a prescription,” explains the report. A growing number of products and services are opening up the potential of telemedicine for both patients and healthcare professionals. Take MaRS venture client Seamless Mobile Health, for example. The company’s patient engagement platform, SeamlessMD, empowers patients with automated education, symptom tracking and feedback following surgery. The platform enables hospitals to deliver higher quality surgical care and to prevent readmissions, allowing doctors to monitor their patients in real-time. Other products, like Figure 1’s app for sharing medical images, allow healthcare professionals to consult other professionals for the purpose of diagnosis. Figure 1 is a photo sharing app for healthcare professionals that allows users to consult other professionals on patient cases. Canada in particular is seeing rising use of e-visits at more than 50% annual growth. In Ontario, dermatologists that used Otn.teledermSF, a platform that allows physicians to take a digital image of a patient’s skin condition and send a referral electronically to a dermatologist, provided more than 1,200 electronic consultations last year. The software resulted in shorter wait times, with an average response time of less than five days compared to eight- to 12-month wait times for a face-to-face appointment. The benefits for patients are certainly enticing: shorter wait times, greater convenience and less time spent on transportation. Currently, many of the 600 million annual visits to general practitioner offices in the United States and Canada are for common ailments such as rashes and coughs. The Deloitte report argues that e-visits allow doctors to spend more time on serious cases, while also streamlining care for patients with simpler cases. In fact, the Ontario Telemedicine Network reports that, through telemedicine, roughly 208,598,000 kilometres of patient travel was avoided by those who used its services in 2011-2012. Residents of remote and rural areas in particular stand to benefit from the trend if implemented. For physicians, access to electronic records through apps and other products can offer a consolidated view of patient health information and facilitate information exchange with patients. 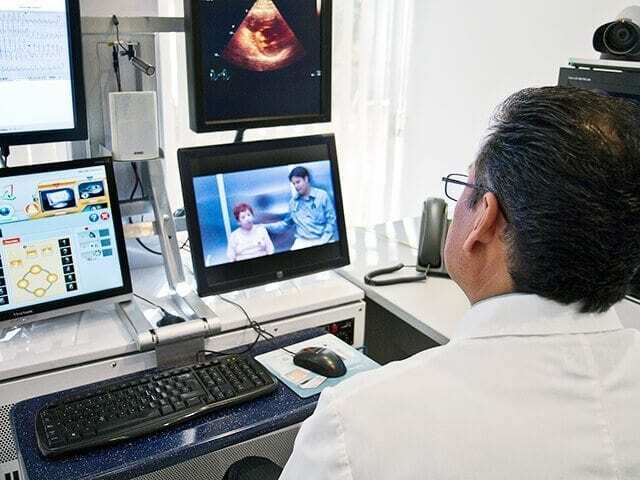 Telemedicine also has the potential to help improve care co-ordination between healthcare professionals, allowing them to share and discuss patient information such as charts and scans. Why is this a breakthrough year for e-visits? Patients are a lot more open. A 2013 Cisco survey found that nearly 80% of North American consumers are comfortable submitting their personal health data to help ensure that healthcare professionals have all of the information available to treat them and offer the best diagnosis possible. When you add an aging population, rising global healthcare costs and more computer-savvy patients into the mix, e-visits are becoming a more viable alternative to a visit to the doctor’s office. The report goes on to say that helping doctors understand the benefits they receive through e-visits will be key to adoption. Read more from the report here.